To post a low score in a competitive national amateur event – a score low enough to make tournament history – is one thing. To post a score on a five-time U.S. Open venue like Olympic Club that goes down as the competitive course record is something entirely different. Both statements applied to Isaiah Salinda’s third-round 62 at Olympic Club’s Lake Course during July’s Pacific Coast Amateur. The Stanford senior had nine birdies and a bogey in his 9-under effort. He lipped out an eagle putt on No. 17, settling instead for birdie. It was one of five consecutive birdies to end the round. “It’s cool to be part of the history at this course. It feels like every good player that’s ever lived almost has played this course,” Salinda said that afternoon as he shot into the lead and opened the door for a one-stroke victory. Salinda was a junior member at Olympic Club and had former Stanford teammate Bradley Knox as his caddie during the Pacific Coast Amateur. We have no qualms about calling Salinda’s record round the round of the year. It was also his career low by four shots, and may stand as the round of his life. He had posted 4-under 66 at Pasatiempo Golf Club the previous spring during the Western Intercollegiate. “I just got hot with the putter,” Salinda said of his 62. Whatever happened that day, it opened the door to more good golf. Salinda followed that performance by making match play at the Western Intercollegiate (only 16 players get on the bracket), playing his way to the semifinals of the U.S. Amateur at Pebble Beach, then logging two top-10 finishes in fall college events (one of which coming at the Nike Golf Collegiate, one of the fall’s toughest fields). Truly, 2018 was a breakthrough year for the South San Francisco native. The U.S. Amateur was his first USGA start. Although its present history only dates from 1967, the Pacific Coast Amateur Championship's roots make it one of the oldest amateur golf championships in American history. The first tournament was held on the links of San Francisco Golf Club at The Presidio, April 24- 27, 1901. Championships were held annually through 1911, all being conducted in California except for the 1909 championship, which was held at Seattle Golf Club in Washington. The Pacific Coast Amateur then ceased to exist, only to be reconstituted at Seattle Golf Club on August 10-12, 1967 with the Pacific Northwest, Northern California, Southern California, Oregon and Arizona golf associations participating. 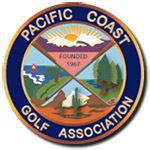 Today, 15 member Pacific Rim golf associations comprise the Pacific Coast Golf Association. Players can be invited to this 72- hole stroke play event by their Pacific Coast G.A. member golf association, or as an individual.